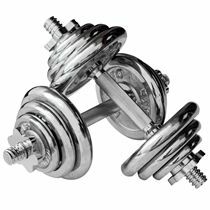 If you're looking for a low priced, high-quality, standard 1" dumbbell set for your home gym then look no further. 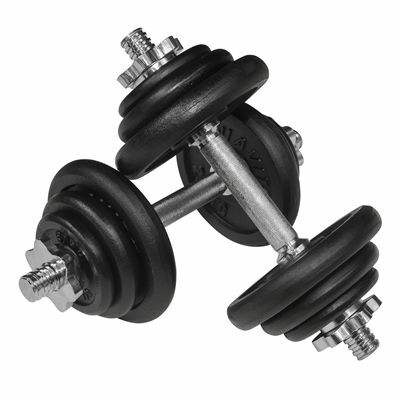 The Viavito 20kg black cast iron dumbbell set has a high-quality durable finish, ensuring that it will compliment any home gym and stay looking good for a long time to come. The bars are finished with a high-grip knurled pattern to guarantee a great grip at all times, even when you've worked up a serious sweat. The spinlock collars and bar threads are precision-machined making changing the standard 1" plates smooth and easy - no stiff, grippy, sticky and annoying collars to be found here. Just a smooth easy swap over of plates when you need one. This great little set features 2 chrome plated, knurled bars, 2 chrome plated spinlock collars and 12 weight plates finished with a high quality flake resistant, matt finish. This set allows you to make x2 10kg (22.4lbs) dumbbells allowing you to train a wide range of muscle groups. Ideal for shrugs, front & side lateral raises, shoulder press, bicep curls, overhead tricep extensions, rows, squats, lunges, calf raises and much, much more. An excellent little set offering outstanding value for money. for submitting product information about Viavito 20kg Black Cast Iron Dumbbell Set We aim to answer all questions within 2-3 days. 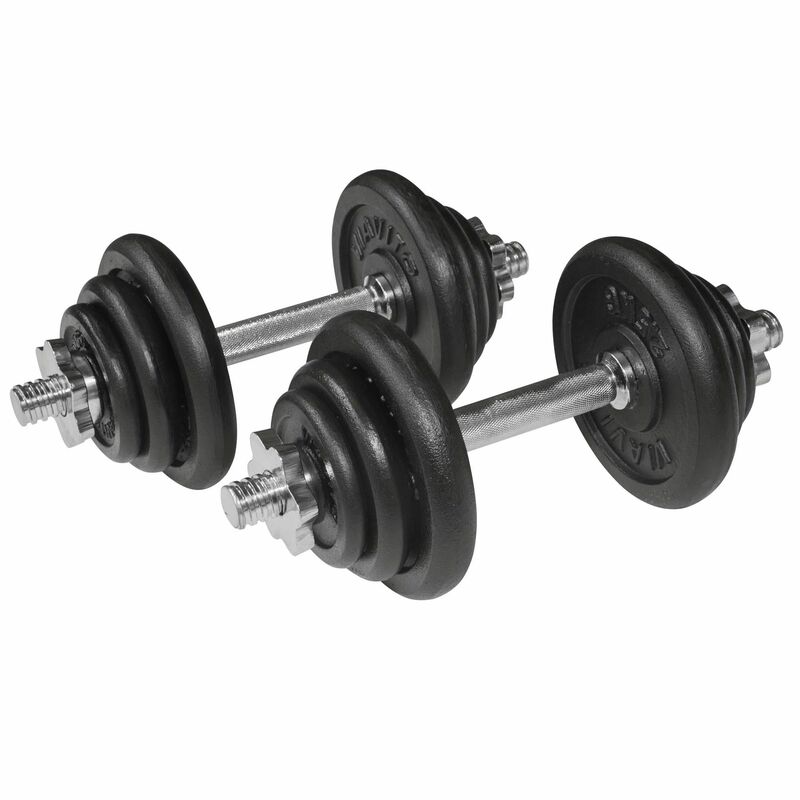 for submitting product information about Viavito 20kg Black Cast Iron Dumbbell Set. We aim to answer all questions within 2-3 days. If you provided your name and email address, we will email you as soon as the answer is published. Is it possible to purchase additional weight plates for this set? Hi, do these come in a carry case? This set does not come with a carry case. Dumbell set good quality and price. Delivered ontime. Great !! Excellent quality piece of kit, superfast delivery, awesome! These feel and look very similar to my old York dumbbells but these are actually cheaper in price. Not much to say other than they do what it says on the tin but for the price I have no complaints. It's always good to have some dumbbells in the house when you can't make it to the gym! Cast iron has always been my preference and the adjustable weight selection is great. I use these for shoulders and arms mainly. Came quick too. Much cheaper than alternatives and I don't see any difference!? The spinlock collars are smooth and go on without any problems (which is more than some more illustrious brands can claim) so they feel really good quality and it's easy to change the weights over. As such I'd recommend these as a geat alternative to some more expensive brands. Cheap and cheerful. Adjustable spin lock very handy so I can vary the load dependent on different exercises I do. Can also purchase extra weight plates so there is scope to improve.No down sides to report. Good product. Been using these dumbbells for a week now and I'm really impressed with the quality for the price. I train at the gym 2/3 days a week but it's nice to have some dumbbells at home for mobility exercises and rotator cuff injury prevention. Spin locks are really good quality which secure the weight plates well and spin freely. Excellent product. 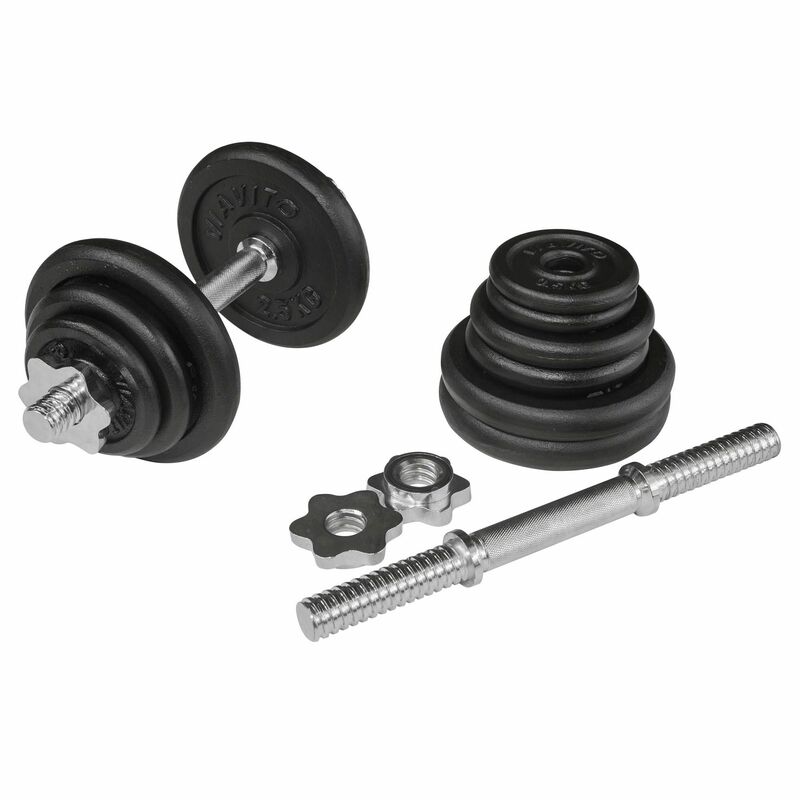 for submitting product review about Viavito 20kg Black Cast Iron Dumbbell Set.